William Buell, youngest child of Benjamin and Sybil (Buell) Sprague, was born in Andover, Tolland county, Connecticut, October 16, 1795. As a boy he showed a keen interest in learning, was a voracious reader, and worked long and hard to hone his speaking and writing skills. After attending the common school of Andover and the academy at Colchester, he then, at the age of fourteen, began college preparatory classes with Rev. Abiel Abbot of Coventry. His studious and excellent work soon provided the opportunity to become a teacher in a district school where he was able to earn funds for his continued education. Not only was he teaching but also studying subjects of his own interest as he prepared to enter the Freshman class of Yale College. His studies in New Haven were for a time inhibited by an eye disease that caused him to delay completing his degree until he recovered and graduated with honors in 1815. It was William Sprague’s intention to enter seminary immediately after completing his degree at Yale, but during the latter part of his senior year he was offered an opportunity to teach in Virginia. He had been recommended by Professor Benjamin Silliman of Yale to become an instructor to the children of Major Lawrence Lewis and his wife, Eleanor “Nelly” Parke (Custis) Lewis, who lived in Woodlawn near George Washington’s Mt. Vernon home. Mrs. Lewis was the youngest of three granddaughters of Martha Washington and the adopted step-granddaughter of George Washington. Sprague accepted the invitation. 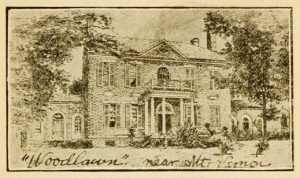 In the fall of 1815 he left for the Lewis home. The young Yale graduate was cordially received by the family and he taught the children until June 1816. Moving from Connecticut to Virginia had also provided William with a break between his college and seminary studies while giving him the opportunity to enjoy the Lewis family’s stories regarding George and Martha Washington. He greatly appreciated the Lewis family and he often recounted fondly his experiences with them to others in subsequent years. In the fall of 1816, William Sprague entered Princeton Theological Seminary where after two years of study he was licensed to preach by the Congregational Association of Ministers in the County of Tolland at Andover in Connecticut, August 29, 1818. He did not return to Princeton for his third year but was instead ordained and installed in the Congregational Church of West Springfield, Massachusetts, August 25, 1819, to assist its aging pastor, Dr. Joseph Lathrop. The following year Lathrop died during his sixty-third year serving the congregation. Young Rev. Sprague became the pastor serving until he was released from his charge to accept a call to the Second Presbyterian Church in Albany, New York, where he was installed August 26, 1829. When the Presbyterian Church in the United States of America (PCUSA) was split into the Old School and New School in 1837, Dr. Sprague continued with Second Church and its 518 communing members in the Presbytery of Albany, Old School. After enjoying a pastoral ministry of forty years, at the age of seventy-four, on December 20, 1869, Dr. Sprague was released by his presbytery from his call to Second Church. At the time of his retirement, the church had a communicant membership numbering 605. He then moved to Flushing, Long Island, to live his final years until he passed away on May 7, 1876, in his eighty-first year. Services were held for him in Flushing on May 10, and then the following day he was remembered in Albany with a service held in the Second Presbyterian Church. 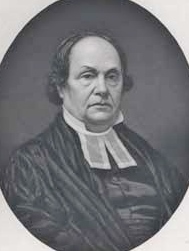 The New York Times, May 12, reported that Second Church was draped for mourning and that several ministers led the service including John Townsend, J. McCluskey Blainey, John James, and Ebenezer Halley of Third Church, Albany, who delivered the memorial address. There was “a large attendance of his old acquaintances” and added to the clergy leading the service were many other ministers seated among the mourners. He was buried in Albany. William Sprague was married three times. First, on September 5, 1820, to Charlotte Eaton of Brimfield, Massachusetts, who died less than ten months later, likely due to complications from the birth of a daughter that would live until 1872. He married his second wife, Mary, who was the daughter of Hon. Samuel Lathrop, on August 2, 1824. Mary died in 1837, and then three years later he married her sister, Henrietta. Children were born in each of the Sprague marriages to sisters—there were two sons and a daughter for Mary, who were joined by two daughters and one son for Henrietta. 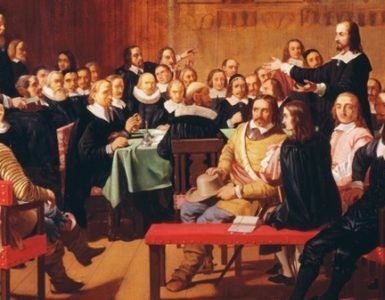 At the time, there was considerable controversy in the Presbyterian Church, Old and New Schools, regarding marriages with near-kin as they were interpreted from Scripture by the Westminster Confession of Faith, chapter 24. One of the forbidden marriages that occurred most often involved, like W. B. Sprague, the marriage of a man to his deceased wife’s sister. 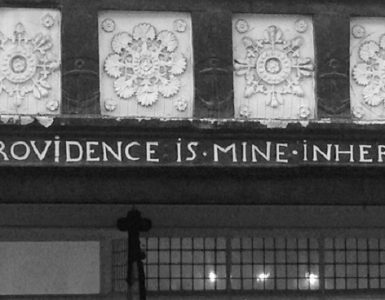 In one case from Fayetteville Presbytery in North Carolina, Rev. Archibald McQueen was prosecuted in the PCUSA General Assembly to the extent that Professor Charles Hodge of Princeton Seminary feared the controversy would split the church. Dr. Sprague was often honored by his peers. The Doctor of Divinity was given to him by Columbia College in 1828, then Harvard in 1848, and he was given the LL. D. by Princeton University, 1869. Princeton Seminary included him on its board for two terms, 1833-1842 and 1864-1871. He often was, as were other Albany ministers, invited to lead the New York State Legislature in prayer during its daily sessions. He preached many times on special public occasions, especially for memorial and funeral services, and his published sermons and addresses number well over a hundred. Though an obviously busy man, Dr. Sprague still found time to be a man of varied interests. He continued his interest in George Washington throughout his life, and he put together a collection of some of his Revolutionary War correspondence along with letters of other presidents. He also collected autographs and some of his contemporaries judged his collection to be one of the finest in the world. As with so many ministers, Dr. Sprague was afflicted with a severe case of bibliomania as seen in his acquiring numerous books and pamphlets on a variety of subjects. Princeton Theological Seminary currently holds the massive Sprague Collection of Early American Religious Pamphlets which includes thousands of titles. He was a member of the state historical societies of Vermont, Massachusetts, Rhode Island, Connecticut, New York, New Jersey, Pennsylvania, Maryland, Georgia, Iowa, and Wisconsin, and he was a member of the Old Colony Historical Society, the American Antiquarian Society, and the New York Genealogical and Biographical Society, among others. All of Dr. Sprague’s varied interests must have left little time, which may explain why he does not appear to have been involved in the general assembly, but records of his presbytery and synod might show more participation. William B. Sprague was a prolific author. Likely his most well known and voluminous production was the nine volume series titled, Annals of the American Pulpit, or, Commemorative Notices of Distinguished American Clergymen of Various Denominations; from the Early Settlement of the Country to the Close of the Year Eighteen Hundred and Fifty-Five; with Historical Introductions, which is thankfully often abbreviated as, “Sprague’s Annals,” by writers. The series includes over 1300 biographical entries. The biographies were compiled by Sprague using published resources, personal correspondence with the subjects, and the recollections of the subjects’ friends and colleagues. The series began in 1857, with vols. 1 and 2, which included Trinitarian Congregationalists; then in 1858, vols. 3 and 4 provided biographies of the Presbyterians; the following year, vol. 5, gathered the biographies of prominent Episcopal ministers; then vol. 6, published in 1860, recounted Baptist ministers’ life stories; the next year, vol. 7, narrated the experiences of Methodist ministers; a few years later in 1865, vol. 8, expanded the definition of minister to include the Unitarians; and finally vol. 9, was published in 1869, to provide information about mostly Lutheran and Reformed clergy. Dr. Sprague had completed his tenth volume at the time of his death, but it was never published, possibly due to its eclectic collection. Volume ten contained 127 additional biographies dispersed among a more encompassing group including the Quakers, German Reformed, Moravians, Cumberland Presbyterians, Freewill Baptists, Swedenborgians, and Universalists. 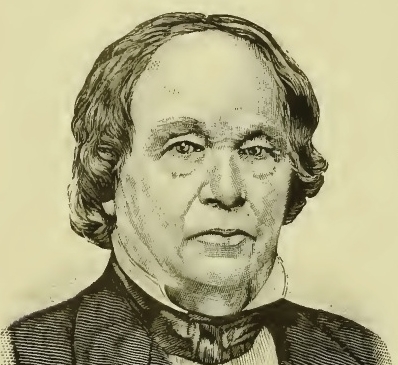 In A Biographical Sketch of the Rev. William Buell Sprague, by C. B. Moore, there is included a list of several more Sprague publications. 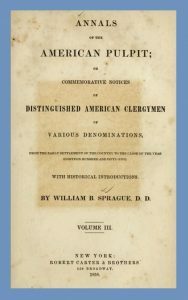 Notes—If you are unfamiliar with the terms “Old School” and “New School” mentioned in Sprague’s biography, then click HERE to access the Presbyterians of the Past post of the 1865 Synod of Pennsylvania, New School, minutes, which are introduced with a brief explanation of the terms’ meanings. Eleanor “Nelly” Parke (Custis) Lewis grew up in Mt. Vernon and the location of her room is known. A very nice video of less than three-minutes length is available at, https://vimeo.com/109487697. Solid Ground Christian Books reprinted the volumes of Sprague’s Annals that provide the biographies of the Presbyterians and the Reformed Dutch, Associate Church, Associate Reformed, and Reformed Presbyterians, in three volumes in 2005. An index of the biographical subjects in Sprague’s Annals is available as compiled by Marie E. Lamoureux and published in, Proceedings of the American Antiquarian Society, 1994, which is available in PDF for personal study on the AAS site. Sources—the main source used was, A Biographical Sketch of the Rev. William Buell Sprague, D.D., LL.D., by Charles B. Moore, New York: Privately Printed, 1877; C. B. Moore was a member of the New York Genealogical and Biographical Society, so he included a good bit of Sprague family tree information in this pamphlet and as was mentioned in the current biography, he provided a list of Sprague’s publications. The Princeton Seminary Necrological Report for Sprague was also used, as well as PCUSA assembly minutes, and other Presbyterian reference works. The engraved portrait of Sprague was supplied courtesy of the PCA Historical Center, Wayne Sparkman, Director, and the other portrait is from Nevin’s Presbyterian Encyclopedia. The image of Woodlawn is from, Mt. 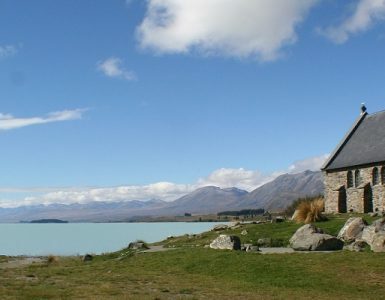 Vernon and its Surroundings. 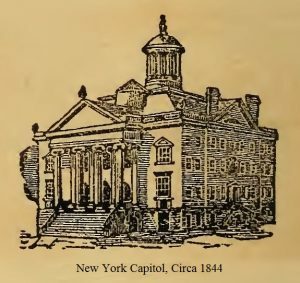 Some Incidents in the Life of General Washington, Washington: Joseph I. Keefer, 1906, and the old state capitol building image is from The 1844 Albany City Guide, Albany: Printed by W. C. Wendell, both publications were used in their digital forms as found on Internet Archive.